When we sailed to Eleuthera, we thought we’d only be here for a few days before heading on to the Exumas. But we’ve stayed a lot longer than a few days. The more time we spend in Eleuthera, the more we fall in love with it. Here’s a recap of our last week and why we just can’t get enough. 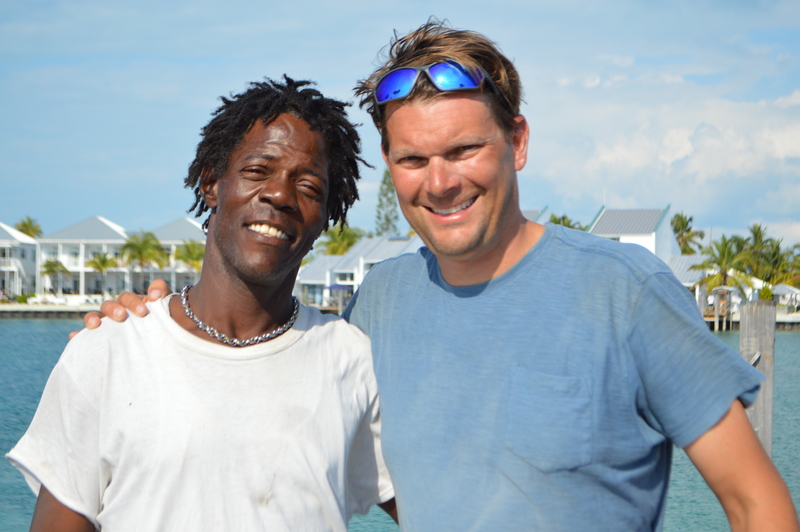 In my last post I wrote about our time in Hatchet Bay, Eleuthera and how we got to know some of the locals and how they helped us with some repairs on the boat. One guy Ben asked Cam if he wanted to help pull up his fish pots. Fish pots are like lobster pots or crab posts, but they catch…you guessed it…fish. So on our last day in Hatchet Bay, Marc and Cam went with Ben on his boat to the fish pots. At the end of the excursion, Ben gave Cam the best two fish. Again, we are floored by the generosity here on Eleuthera. When we left Hatchet Bay, we ended up taking Ben’s boat with us and pulling it behind Adagio. Ben is giving his boat to Donald (read about Donald and Ben in the last post), Donald is building a boat for Ben…maybe? (I got a little lost on all the transactions), and Donald in the meantime had our dinghy in his backyard down in southern Eleuthera. All three of us were switching boats, batteries, and gas tanks around that it all got confusing for me. Luckily Marc knew what was going on. Ben’s, well now Donald’s, boat is a tank compared to our dinghy so it slowed us down about a knot. There was virtually no wind as we were heading south, but luckily we had plenty of daylight hours and plenty of fuel. Or so we thought. It was about 6 pm and we were about an hour away from Cape Eleuthera Marina, our destination. We planned to spend two days here at the marina while Donald fixed the dinghy at his house and made a few more repairs to Adagio. The sun was lowering in the sky and it was breathtaking. And then it happened…the engine died. Son of a gun. Marc put two and two together and realized nothing was wrong with the engine. We had simply run out of fuel. Our generator has been blowing more smoke than normal so our fuel consumption calculations were off…way off. We have extra jerry cans of diesel fuel on board so we poured those into the tank. But Marc informed me that with the strong current pushing against us we would run out of fuel again before we reached the marina. We continued on course and as expected we ran out of fuel as we were approaching the cape. The wind picked up just a bit so as I worked on dinner below, Marc raised the sails and s-l-o-w-l-y worked the boat as far south as we could at 0.5 knots. I heard Marc in the cockpit chanting, “I think I can. I think I can.” At this point it was getting dark and I worked on getting the kids in bed. Marc was still in the cockpit chanting. My amazing husband finally sailed us to the entrance channel of the marina. We talked about sailing into the marina but I could see a mega yacht in there. We quickly decided it would be better to get a good nights sleep and just anchor outside the entrance and avoid ANY risk of accidentally sailing into the yacht. We called Donald and he said he would come on his boat in the morning to bring us more fuel. Donald lives about 10 minutes from the marina. We dropped the hook and went to bed. The next morning, Donald came zooming out in his boat, Da Reef Dancer. In typical Donald style, he had his Reggae music blaring and he was dancing and smiling. Maria heard the music from down in the galley and ran up the companionway shouting, “Mr. Donald! Mr. Donald!” When Donald saw Maria, he yelled back, “Hi Baby!” These two have formed quite a bond over the last two weeks. Donald gave us an additional 15 gallons of fuel from his jerry can and our engine started right up. So as we entered the marina, we needless to say headed straight for the fuel dock. The sound of fresh diesel going into the tank was music to our ears. We are now going to run the generator less and recalculate how much fuel the generator is burning. And of course fuel up more often just to be on the safe side. 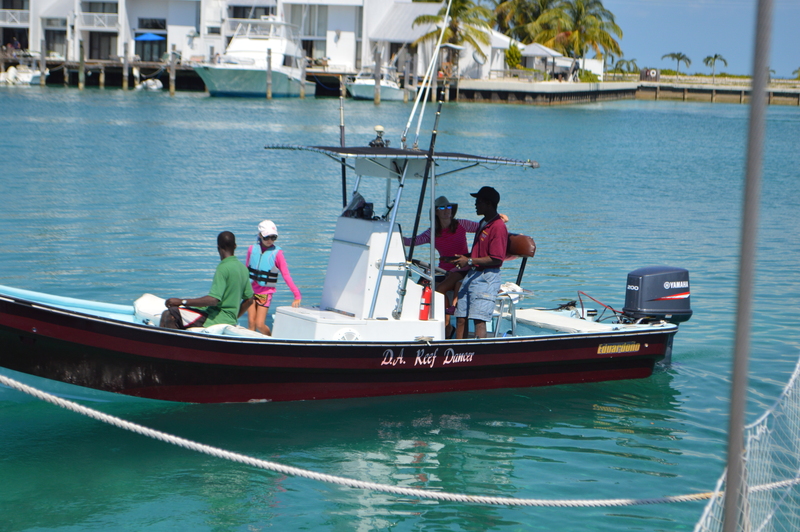 All boaters say that at some point two things will inevitably happen: 1) you will run aground (check – did that last year in the Abacos) and 2) you will run out of fuel (check – did that a few days ago). Excellent…we’ve joined the club and hopefully won’t make those two mistakes again. Donald has been such a blessing. 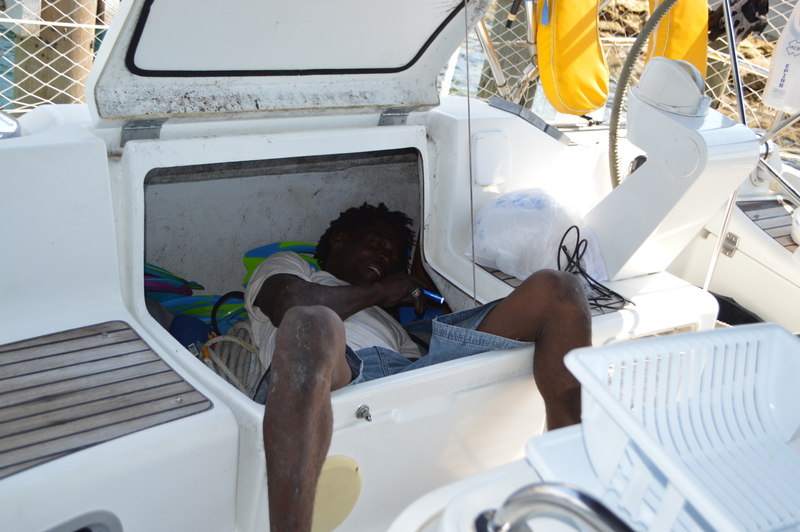 Of course we are so appreciative of all his help with fixing our dinghy and the boat. (He repaired the refrigerator, the fuel line, the starter, and the engine hour meter.) I love this photo of Donald in one of our lazarettes working on the engine hour meter. We’ve gotten to know Donald, his son Talino, and his wife Kristel on a personal level too. They hung out with us one evening for dinner on our boat here at the marina. And another night we had dinner over at their home. And Donald has let us borrow one of his cars all week. Beyond generous. And not only does this family keep busy with fixing boats, they run a tour company. If anyone plans a vacation to Eleuthera, we cannot recommend enough Donald and Kristel’s Eleuthera Tours company. They’ll fix you up with a deserted island, rum punch, and dancing with Donald himself. One afternoon, Maria, Joellen and I went with Donald and Talino to pick up some guests he had taken to an island. Maria said, “Too fast!”, and Donald said, “Okay darlin'” and slowed his boat down. Maria is used to our slow sailboat. All five of us in our family have gotten really close with Donald. He calls us his family now and we definitely consider him family now as well. As I mentioned before, he and Maria have a special bond. She gets so excited each day when she sees him and runs to him. Kristel is from Florida and she hopes to bring Donald to the US for an East Coast tour sometime soon. We’ve all agreed that they will for sure stop and stay with us when they come to the States. This is not goodbye. The repairs to the boat have taken longer than expected but we are actually happy because we’ve been able to stay in Eleuthera and experience so many things and meet many new people. Our second day in Cape Eleuthera, a catamaran called Dawn Patrol pulled in with a boy Cam’s age. The boy, Townes (cool name), and his parents are from the Outer Banks of North Carolina (again, very cool). They have three coffee shops there called The Front Porch and since winter is low season for them, they pull Townes out of school every year for a few months and cruise the Caribbean. Camden and Townes both love fishing so for three days were joined at the hip. Cam even had a sleepover on Dawn Patrol. We were all sad to say goodbye but we promised we’d come stay with them in the Outer Banks next fall. And yes, that is Camden sprinting with a dead fish in his hand. While Camden and Townes were busy fishing each afternoon, Joellen, Maria and I went beachcombing. Marc of course was working on the boat projects. These two girls could go shell hunting for hours on end. And when we get back from the beach, Joellen and Maria make jewelry from their treasures. Today they made sea fan necklaces and earrings. Neither of them have their ears pierced, so they used scotch tape to make the earrings stick. One day while Cam, Townes and Joellen were walking around the marina, they ran into some grad students and interns working on shark research. The group was throwing big chunks of fish into the water and observing the nurse and bull sharks. Cam, Townes and Joellen hung out with the researchers all afternoon and asked lots of questions. I’d say this counts for science class for the day! Our kids even got an invitation to visit the school the following day to learn more about all the marine research they are doing. Field trip! I’m going to do a separate blog post about our trip to the Cape Eleuthera Institute. 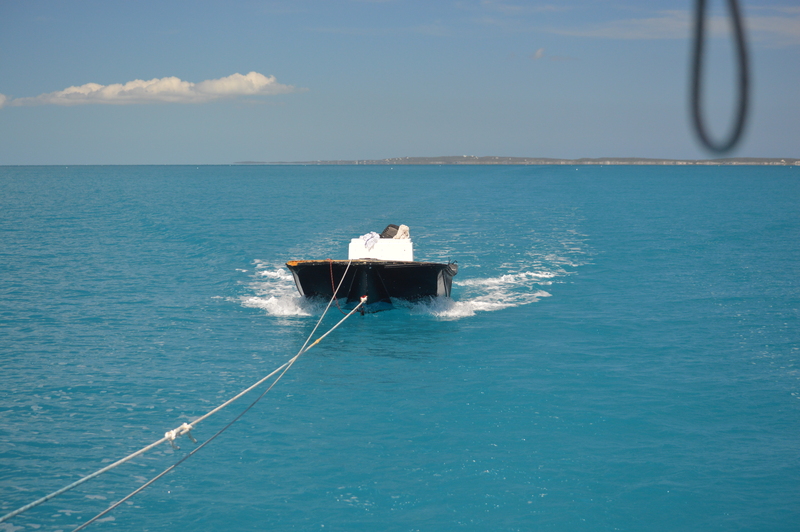 The near-term plan: We were going to leave Eleuthera today and sail to the Exumas. But, Camden met a fishing boat yesterday and received an invite along with Marc to go deep sea fishing today. We can’t pass that up. And Joellen just met a girl who is staying on a different fishing boat with her grandparents for Spring Break. Joellen begged to stay another day also. So, as we say every day, “We plan to leave tomorrow.” But we’ve been saying that quite awhile and we’re still here in Eleuthera. We are so happy with staying and it feels like our home away from home. As always, I love reading your blogs. After reading the last few blogs it has been re-emphasized to me on how much your kids are learning. They are learning so much more than they could ever in a class room. They are learning to be welcoming to all people no matter the age, race or the background they come from. They are learning that if people work together this world could be a better place than when they first came into it. The gift of this experience you are giving your children is priceless. We will miss you in Florida. You are in my thoughts and prayers. Kelly, thanks for the kind words as they mean a lot coming from you. It is really neat to see this journey through the kids eyes. Maria has been the one who all the locals want to hug and kiss. Still keeping the great adventure at our computer screen, thanks…As for the boat name “Dawn Patrol”….I live it! Oh my that is hilarious! Such an amazing trip! Thanks again for sharing it with us. How ’bout some videos ? Could shoot them with your smart phone, or even a semi-smart phone. That would be great ! Whew — So happy you made it to safety!! If we ever make it to Eleuthra we’d love to meet Donald. wonderful stories.. .Thanks as always for sharing.